The center of San Diego’s homeless crisis has changed a lot more than a year after a hepatitis A outbreak inspired dramatic city action.The tent villages are gone. What was once a concentrated city within a city is now a patchwork of mostly clean streets interspersed with misery, filth and drugs. In East Village and along the fringes of Barrio Logan, Sherman Heights and Logan Heights, the center of San Diego’s homeless crisis has changed a lot more than a year after a hepatitis A outbreak inspired dramatic city action. The tent villages are gone. But it is still bleak. What was once a concentrated city within a city is now a patchwork of mostly clean streets interspersed with misery, filth and drugs. On one block considered San Diego’s skid row, drug crime is more exposed than ever – with open drug use and deals. The tents and more stable homeless San Diegans seem to have moved elsewhere, leaving behind those with more visible struggles. On other blocks, there are luxury apartments, restaurants and community centers. Some areas once teeming with homeless San Diegans – such as Fault Line Park in East Village – are now quieter with hints of the homeless crisis. The reality can change by the day and often shifts along with police enforcement. Perspectives on the state of the crisis vary widely too. Several residents, business owners and community leaders tell Voice of San Diego they are exhausted by a series of city decisions – past and present – they believe solidified the neighborhood’s place as a village of homelessness. In some areas, residents say drug activity has gotten worse, making some of their homeless neighbors more hostile and unpredictable. Others suggest the areas’ challenges have improved since the hepatitis A outbreak. A downtown business group’s monthly counts show the number of homeless San Diegans living on East Village streets has dropped 44 percent since the height of the hepatitis A outbreak. The mayor’s team and police officials often point to a dramatic reduction in near-permanent camps and the increased public safety and cleaning services they have deployed in the area. Police say they try to respond to complaints and to clear camps before they build up again. But the police and mayor’s staff have also admitted the area is dangerous. They recently weathered criticism that they may have disrupted the region’s annual homelessness count when they stepped up arrests after tents built up during January rainstorms. East Village resident David Gapp, who regularly walks with his wife to volunteer in Sherman Heights, said there’s been a reduction in tents and shopping carts on city sidewalks. “I really feel things are much better than a year and a half ago,” Gapp said. “You realize at every moment something could go really wrong,” said Rev. John Auther, pastor at Our Lady of Guadalupe, a Catholic church blocks from both the storage center and 17th Street, often dubbed San Diego’s skid row. During a walk around his grounds late last month, Auther recounted attempts to steal from the church’s outdoor donation boxes, how funeral attendees recently stepped over feces in a church lot and the decision to hire security for the school – a move Auther said hadn’t been necessary during past gang wars in the neighborhood. And in January, Auther said, someone stole copper pipes from a church-owned apartment that parishioners are working to convert into a temporary home for homeless families. 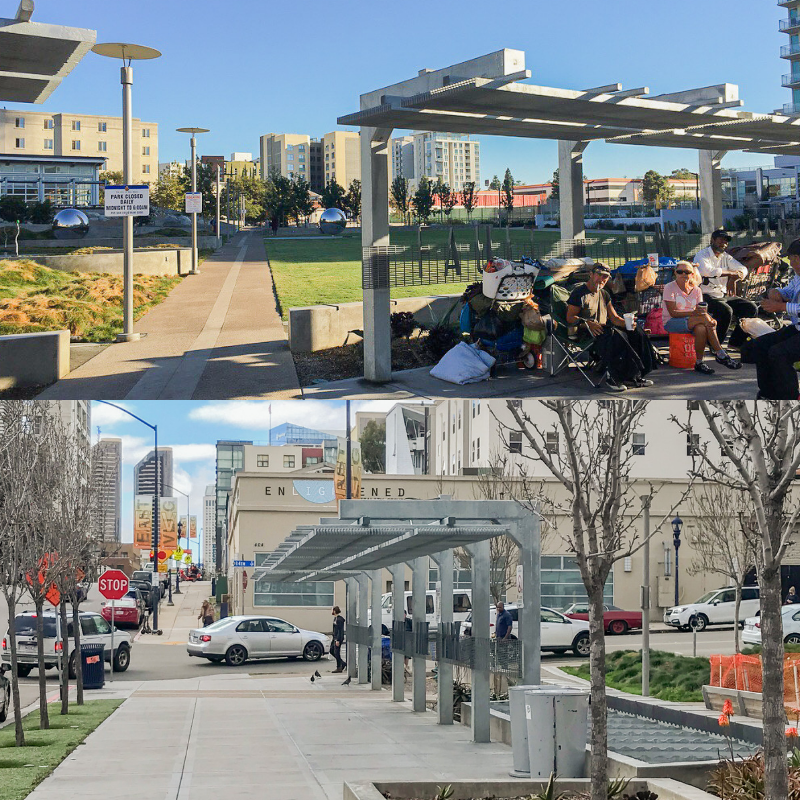 In August 2017, tents dominated sidewalks in the area where East Village, Barrio Logan, Logan Heights and Sherman Heights converge. Then, amid a rapidly escalating hepatitis A outbreak, the city scrambled in September 2017 to clear and disinfect city sidewalks. Mayor Kevin Faulconer also said the city would offer additional services to homeless San Diegans. The area got two new shelters and a storage center where homeless San Diegans can store their belongings. Family Health Centers of San Diego will open a homeless service hub this spring. Auther has been one of a slew of residents speaking out against those plans. For years, the area has been the countywide hub for homeless shelters and other aid. That is a major reason why homeless San Diegans gather in the area. But the new storage center allowed the city to revise a key legal settlement, paving the way for what police have said is a game-changer in the city’s efforts to keep homeless camps from building up again. The change has allowed city workers to give homeless San Diegans three hours’ notice – down from 72 hours – before conducting sweeps of homeless camps if there is space at the storage center. “That is what allows us to keep the street clean,” said police Capt. Scott Wahl, who leads the city’s Neighborhood Policing Division, which focuses on quality-of-life crimes. The new rule, coupled with continuous police enforcement, has meant far fewer tents. For homeless San Diegans, the increased enforcement came with a cost. Latoshia Hardnett, who settled in East Village in 2017 after being released from prison, said police are now quick to react when tents go up. She no longer has one but she said police are still quick to crack down on her and others staying on the streets. “Police mess with you all the time,” said Hardnett, who recalled a less aggressive approach in years’ past. Yet the number of homeless San Diegans in the area seems to be rising again, she said. Homeless San Diegans often wander into the street as cars come off the freeway onto 17th Street and Imperial Avenue and in recent days, dozens of people have milled in several surrounding blocks during the day and at night. Urine stains and human feces are common on sidewalks. More homeless people living in cars also seem to be parking in the area following a City Council vote to repeal a ban on vehicle habitation. But what alarms some residents and business owners more, they say, is an uptick in open drug use and sales. On Friday afternoon on 17th Street, an area cleared during the hepatitis A outbreak, at least two people smoked crack on the sidewalk and two men exchanged cash and heroin. Others nodded off, fresh from a hit. Many tell stories of watching people smoke crack and shoot heroin in broad daylight on a daily basis. “They have no fear of anything,” said East Village resident Eva Lee, a hairdresser who said she carries a pocket knife and pepper spray to protect herself. Wahl and Capt. Mike Holden, who oversees the police department’s central division, say police have tried to curtail drug activity and quality-of-life crimes in the area. They expect to rack up $2 million in overtime charges this year to deliver on promises of increased patrols following the opening of the storage center. During a month-long operation in East Village last August, police arrested 48 people for drug sales alone. Wahl said the police department’s homeless outreach team and homeless-serving nonprofits also partnered during the effort to offer shelter and other aid to hundreds of homeless San Diegans. Police acknowledge enforcement efforts rarely have a lasting impact. When one drug dealer is arrested, Holden said, another quickly materializes and those who are arrested often soon return. “It’s frustrating for us to see people we’re arresting for selling drugs back out in a few days, arresting people over and over again,” Holden said. And police have made many arrests. Data provided after a public records request shows drug-related arrests spiked by more than a third in East Village and Sherman Heights from 2017 to 2018. Despite outcry and a legal challenge from advocates, police have also continued to use laws that bar blocking city sidewalks with trash bins or erecting a tent to try to keep homeless San Diegans from establishing tent villages. Those homeless San Diegans often return days later or simply move a few blocks away. Longtime Logan Heights activist Connie Zuniga, who fought the mayor’s storage center proposal, said she has appreciated the police department’s stepped-up response. She just doesn’t believe police have the resources to combat the area’s challenges. 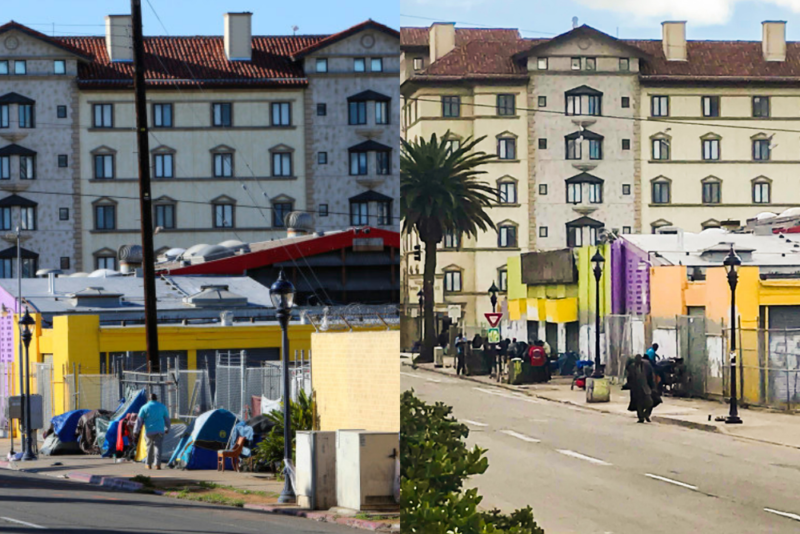 Homeless San Diegans have been affected by the changes in the area too. Stephen French, who has recently settled near the Imperial Avenue underpass, said he moved to the neighborhood about three months ago after living on the street in other areas for years. French said he’s been surprised by both the volume of open drug use and mental-health challenges. “I’ve never heard so many people talking to themselves in my life,” French said. Derek Williams, who initially lived on East Village streets after falling into homelessness in 2016, said he and his wife eventually found it too chaotic and moved elsewhere. Williams said they tired of intense early morning police enforcement and thefts among the homeless population. Williams still regularly visits East Village to meet friends or attend practice with the Voices of Our City Choir and when he does, he said, he’s hounded by drug dealers. Yet the pull remains for many homeless San Diegans for another reason: East Village and now Barrio Logan and Sherman Heights are places where they can access services. They count on free meals in East Village, check into the homeless tent in Barrio Logan or store their belongings in Sherman Heights. “You go to other places and you’re not gonna have food as much,” said Sean Davis, who said he has bounced on and off the streets of East Village over the past six months. City Council members Vivian Moreno and Chris Ward, who represent the Barrio Logan and East Village neighborhoods, and Greg Block, a spokesman for Faulconer, say they are aware of the strain that homelessness and drug activity have put on the neighborhoods. Ward, who also chairs the countywide Regional Task Force on the Homeless, said he supports aggressive police efforts to address drug issues and has continued to urge investments in homeless-serving programs, outreach and housing across the city. “We have to actually serve homeless people in other communities,” said Ward, who last year successfully pushed a resolution to build supportive housing facilities in every Council district. Still, Ward said, homeless services remain in the East Village, Sherman Heights and Barrio Logan neighborhoods because many homeless San Diegans live there. Block said city officials are now seeking out locations in other neighborhoods for safe parking lots and homeless storage but defended the city’s decision to add additional services in the eastern reaches of downtown. He said the city is serving homeless San Diegans where they are, and that police and cleaning crews have mobilized to respond to the neighborhoods’ concerns. Andrew Keatts contributed to this report.